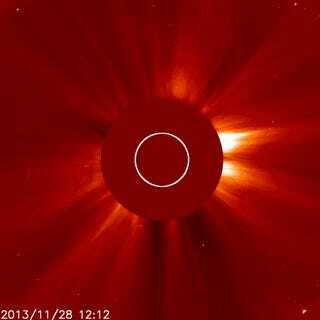 Comet ISON is inching ever closer to the Sun, and it'll get incredibly close later on today. In the meantime, though, you can watch its most recent progress in this video from NASA. Updated: Sad news, folks. Like Icarus, it seems comet ISON's visit brought it a little too close to our sun, causing it to burn up and mostly disintegrate today. Several sources are reporting the death of the comet, which means the only thing you'll see in the night skies this December are maybe a few snowflakes. But it's not all sad news. According to NASA, as the broken up comet slingshots around the sun, it will give scientists a great opportunity to study what's inside ISON and what it's made of. So there's definitely still reason for giving thanks today.